Why is it that the best places deserve the name of “kakureya/Hidden spots” in this country? After all, you need some courage to try and entice customers away from their usual haunts. Or is it because you simply have a lot of confidence? Mr. Mamoru Miyaji and his sweet mother, Fusae, certainly deserve all the praise and fame for having offered first-class local products and creations in their tiny establishment for the last 34 years. 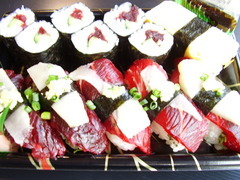 Sushi Iroha was originally opened by Mrs. Miyaji as a traditional sushi restaurant very close to the sea. Ten years ago her son, having spent a few years learning his chef skills at various establishments, took over under the guidance of his dame and added sushi made exclusively with vegetables grown in the area. Obtaining such produce after all is not so difficult as the Hamamatsu-Iwata vegetables growers are famous in the whole country. But he certainly needed all his savoir-faire to accomodate them. On Friday, January 18th, I took the opportunity to visit Sushi Iroha as it stands only two stations away from my university. Having gone off at Toyoda JR Station I had to take a taxi (1,000 yen) as I had no clue as to which bus to ride. I arrived just as it was opening. A good strategy as the place sits only 7 guests and is quickly full unless you had previously reserved your seat, a must on weekends. Mr. Miyaji is a very friendly and immensely knowledgeable gentleman who will be happy to answer any questions, however tricky. Ladies also can please themselves with a great umeshu, too! 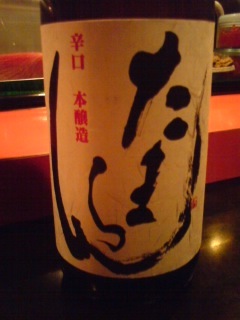 This said, I chose a junmai sake before ordering the vegetable sushi set I had come for! Incidentally all vegetables are cooked or marinated, some as far as two days in advance. Moreover, Mr. Miyaji uses only salt of his own making by slowly heating sea water from Yaizu for 48 hours! All absolutely perfect! I’m not a vegetarian, less a vegan, but I certainly would not mind becoming one if served that kind of food! Next I was served a sublime creation concocted with Ebine Imo/Ebine Tuber served mille-feuilles style intersped with sushi rice and presented with dashes of olive oil, seame oil/goma abura and soy sauce/shoyu. Enough to satisfy a hungry gourmet! 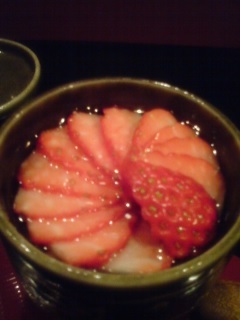 To top it all, I was served another of Mr. Miyaji’s creations, which would please anyone with a sweet tooth! Hot pudding. The top half being a traditional cream pudding, the bottom half sweat meat/anko, the whole decorated with local strawberry! 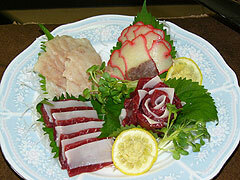 One can easily eat whale meat at Sushi Restaurants In Shizuoka Prefecture or even buy it directly at supermarkets. 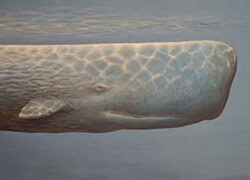 Most of it come from Sperm Whales/Mako Kujira. 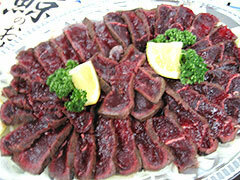 Whale meat should not be confused with Iruka/Dolphins whose meat has appeared on Japanese tables since times immemorial. It concerns an entirely different taste and cooking. 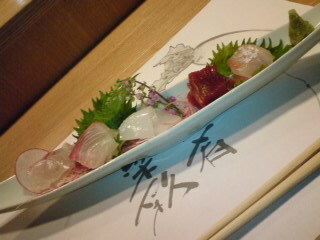 “Kujira Tataki”, that is whale meat cooked in small cuts ready for sashimi. 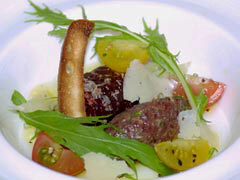 “Kiujira Salad”, including Whale Tartare and Carpaccio. “Kuijra Seikyoyaki”, a Japanese way of cooking and serving cut to be eaten with hot rice, or even instead of a beef steak. 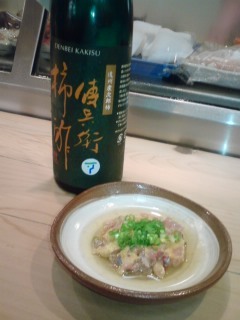 “Kujira Karaage”, or deep-fried whale meat, great with sake! 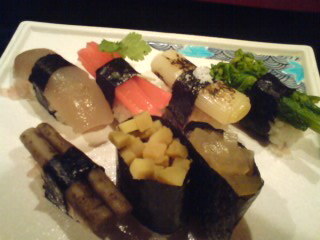 As Sushi, it does come in many guises to accomodate various parts. Each region has its own traditional ways and presentations. Incidentally, whale meat is safer than any meat from land animal, as it is purely biological! I fully understand this article will not be appreciated by some people, but do not expect me to apologize for whatever reasons! I would like to to remind short memories that whales were practically decimated from (under) the surface of this world in the 19th Century by US and European whalers for their oil used in lamps. When the US in particular realised that they were quickly running out, they pushed for mineral oil exploitation with the economical and political consequences we are still suffering from. In short the ovekilling of whales is the direct cause and link to wars in the Middle East. Last but not least, who and what was Commodore Perry after all? A whaler! The US had had promoted a common whaler captain to the grand rank of Commodore for the political and diplomatic needs of the time as he happened to ply his trade in nearby seas! I mentioned that whale meat is safer than beef. Incidentally, who practically exterminated bisons as a policy for driving Indians (Amerindians) out of the way and now makes a big deal of protecting them? 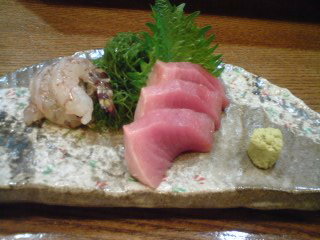 Had a quick “dinner” at Tomii Restaurant yesterday and asked for a plate of sashimi. 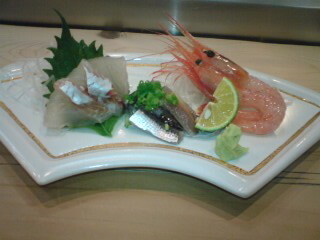 Sashimi sets in Tomii are slightly extravagant but so great! 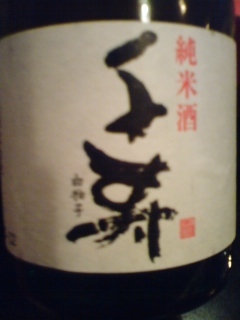 For the record, I enjoyed the fish with somえ Aoshima-Kikuyoi Brewery (Fujieda City) Tokubetsu Junmai! Yesterday saw my third visit to Ekimae Matsuno Sushi near Shizuoka JR Station, a certain proof that it is rapidly becoming a favourite! 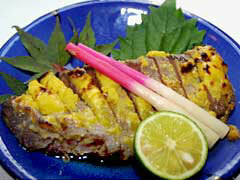 This particular dish is Aji no Tataki/Finely chopped raw saurel/pike mackerel in “namerou” style/white miso+ginger. 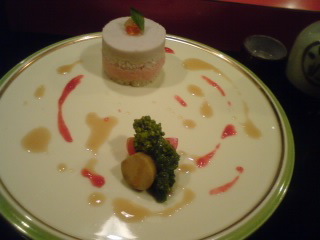 It is topped with “Kakisu”/Persimmon vinegar made in Shizuoka to give it a great sweet and sour touch! Perfect with sake! 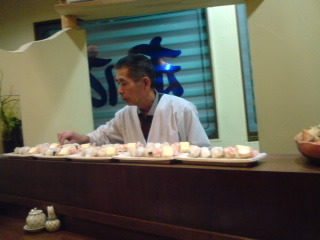 I had wanted to visit a certain Sushi Restaurant in Hamamatsu City since I discovered “Sushiya No Neesan” Blog (Japanese). My wish was finally granted last Friday, December 14th when I managed to get an evening free after University in Fukuroi City. Suehiro-Hamanako no Megumi Aji (Suehiro-Tastes from Hamana Lake) is conveniently located at short distance from Hamamatsu JR Station South exit (only two tarffic lights away). 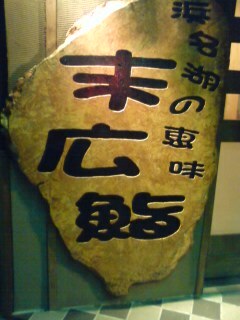 It is a very traditional Sushi Restaurant. It was converted into the present establishment from a Japanese Restaurant 28 years ago by the second-generation owner, Mr. Katsuhisa Yokota presently ably helped by his daughter, Chisako, who literally grew in the restaurant, learning her trade by daily observing her father’s skills. Since this was my first visit I opted to try my favourites and gradually order recommended tidbits. 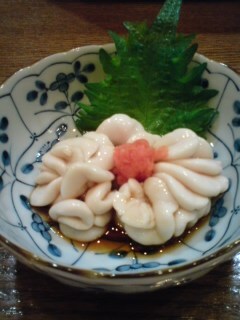 I started with some succulent “shirako” (male cod sperm sacs. This is the real translation, not whiting as some people prudely call them…) with ponzu vinegar and momiji oroshi/grated fresh daikon with chili pepper. 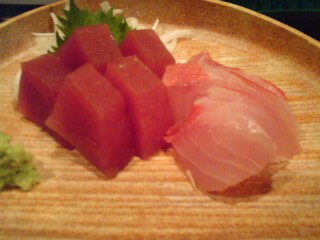 I then asked for the inevitable akami/lean tuna. Chisako San proposed raw kuruma ebi/prawns just caught in Hamana Lake. Succulent! This particular Sushi Restaurant for its “fugu”/globefish. 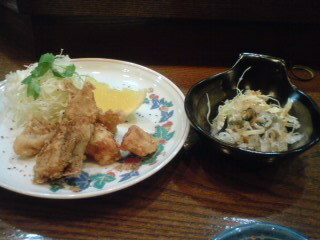 I chose to have it deep-fried/karaage. No need for chopsticks. Just eat with your fingers and lick them. 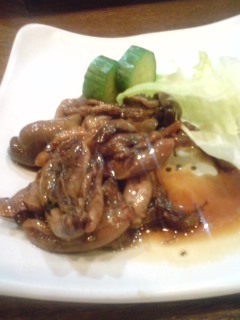 I was offered chopped boiled globefish skin with it and I had to use chopsticks, then (LOL). Certainly better than your fish and chips! 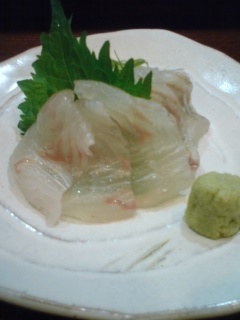 Back to raw fish, I asked for hirame sashimi/sole-flounder. That disappeared quickly, I can assure you! keeping an eye on what was on the counter, I noticed a large dish full of unagi kimo/eel liver simmered Japanese-style by Mr. Yokota. Absolutely perfect with Japanese sake! I was going to switch onto the traditional kampyo maki/dried gourd shavings and negi toro maki/finely chopped leeks with tuna, when I was offered a dish perticular to Hamana Lake District: Haze tenpura. “Haze”, or goby is a small fish caught in Hamana Lake at low tide. 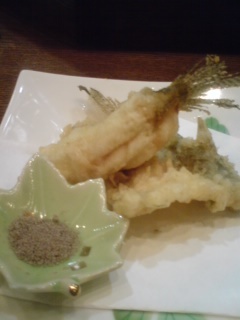 It is best eaten as tenpura (with your fingers) with a little salt and pepper. 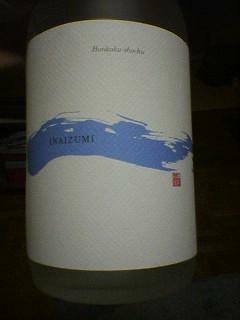 All right, I fanlly had to call it a day, what with the local sake from Hana no mai Brewery (Hamamatsu City). I had a train to take back to Shizuoka City. But it will be a short time before I visit the place again to try the other morsels!